Giselle in 3D | Style Weekly - Richmond, VA local news, arts, and events. 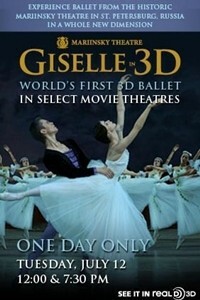 The world's first ballet in 3D is coming to select movie theaters this summer. NCM Fathom and More2Screen proudly present Giselle in 3D from the historic Mariinsky Theatre in St. Petersburg, Russia. Experience the beauty and movement of each graceful step in a whole new dimension on Tuesday, July 12th at 12:00pm or 7:30pm.